Low-speed synchronous motors provide highly precise speed regulation, low-speed rotation and quick bi-directional rotation. The basic construction of low-speed synchronous motors is the same as that of stepping motors. 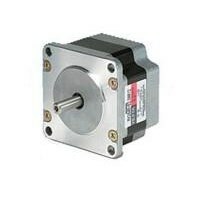 Since they can be driven by an AC power supply, they are sometimes called AC stepping motors. The motor rotates at a speed proportional to and accurately synchronized with the frequency of the power supply. A fluctuation in load does not affect the rotation speed. This motor can be driven at a continuous rating even when bi-directional operation is required. If operated within the permissible load inertia, the motor can start, stop and reverse with 1.5 cycles (0.03 sec at 50 HZ, 0.025 sec at 60 Hz) of the power supply frequency. The motor can be stopped instantly by turning off the power supply. The stopping accuracy with the motor's permissible load inertia is ±10°. When a precision switch is used, simple and precise positioning is possible. Constant speed can be maintained even during lowering operations. Low-speed synchronous motors are suitable for applications where vertical operation at a constant speed is required. Pinion shaft models are available that can be connection to standard Oriental Motor GN-type low-noise gearheads. Low-Speed Synchronous Motors (gear motor) ! IndoTrading.com adalah media iklan khusus Perusahaan, Toko, Distributor, Grosir, Agen, Supplier, Importir, Exportir, Trading dan Pabrik. Jika Anda tertarik untuk membeli Low-Speed Synchronous Motors (gear motor) ini dengan harga murah, Mohon hubungi Kontak Perusahaan ini diatas.